Razer is one of those brand names you just sort of associate with gaming. Either you have Razer-branded gear yourself, or you know people who are primed and ready to show it off. Well, they’re still pumping out computers and gear at a blistering pace, with the latest in their lineup out today. 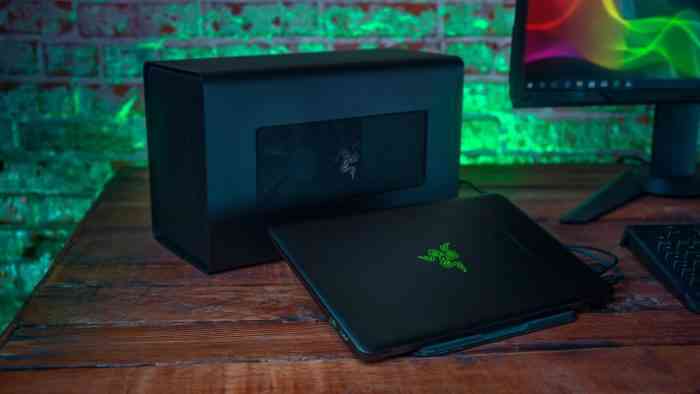 Razer has a fresh batch of badass laptops for sale, assuming you have an inordinate amount of cash piling up with nowhere to go. Well, what they’ve released are a new line of Razer Blade models. The lowest tier comes with a GTX 1060 and 16 GB of RAM, while the top end is 4K with a touch screen. Each and every one of them is also available with an SSD, which is crazy important if you want this monstrous laptop to start up in less than 15 minutes. Razer is also releasing something called the Core X. It’s an external GPU compatible with PC and Mac machines, for when you want an extra load of oomph added to your portable gaming. Of course, the Core X doesn’t look suuuuper portable, at least not in the unveiling video embedded below. But that’s not important when you’ve got all that extra graphics power, right? Both of these things (the Core X and the new Razer Blades) are available right this second, if you’re so inclined. Razer Kraken Tournament Edition Review – Release the Kraken!